Congratulations on choosing a 21st Dynasty Skull 3 Neoprene Face Mask! While it is, of course, a thrill to possess a Neoprene Face Mask from any period, we think you’ll find there’s a level of prestige that comes with owning the dessicated Skull 3 Neoprene Face Mask. For example, you can show it off to society types at black-tie events, something you most certainly cannot do with the skull your lowlife metalhead friends stole from a crypt in the local graveyard back in the ‘90s in hopes of making it into a bong. One sure way to enjoy your Skull 3 Neoprene Face Mask is by exposing it to moisture because the Stretchy neoprene material is warm and water resistant. If he (or she) carries a curse—and many Skull3 Neoprene Face Masks do—your Skull3 Neoprene Face Mask may undergo a process of rudimentary reanimation. The victims of such curses sometimes characterize this process as “coming back to life,” but the expression is misleading. Reanimated Skull3 Neoprene Face Mask cannot conduct conversations, go bowling, cook stir-fry, vote, or do almost any of the things you and I associate with “living.” Instead, they can usually only perform an awkward, shuffling perambulation in the direction of the person who disturbed their rest, and strangle him. 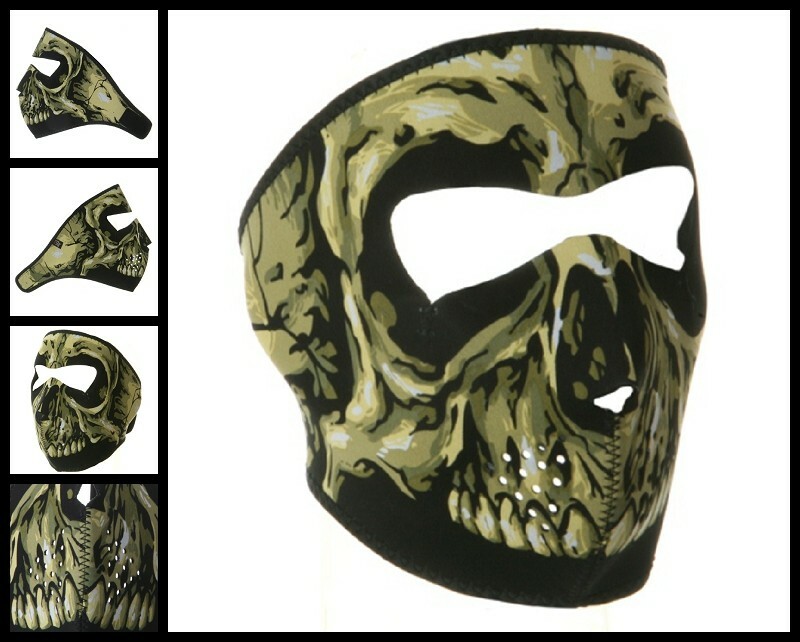 Our Skull3 Neoprene face mask features full coverage of the face and ears. Stretchy neoprene material on the skull3 neoprene mask is warm and water resistant. Patterns are reversible to solid black material. Velcro closure ensures great fit with goggles, with a helmet or without. One size fits most.